I didn't think this could be done until I thought about it awhile. This little circuit is used to randomly flash some of the ultra-bright LEDs on this LED-illuminated star. The 40 blue and white LEDs are series-connected and powered by a current-regulated, high-voltage power supply. The current is regulated at 310 milliamps. With LEDs connected in series, the same current flows through all LEDs in the string. One current regulator can serve them all. The series configuration also allows LEDs of different colors to be mixed within the string. With a voltage-adjustable power supply, a series string can be as flexible as a parallel configuration, allowing as few as one LED, up to the maximum number the supply can handle. Wire size and length are secondary considerations. The interconnecting wire for a series string need be sized to handle only a fraction of an amp (typically), whereas the parallel configuration may require wire (and power supply) sized for tens of amps. Also, depending on the layout of the LEDs, the length of wire needed to interconnect a series string may be less - as was the case with the LED-illuminated star. So how do you independently flash 'em? The circuit is connected across (parallel with) each ultra-bright LED you want to flash. The red LED flasher flashes at around 2 Hz. When the red flasher is ON the transistor is switched ON, allowing current to flow through resistor R. The resistor shunts current from the ultra-bright LED, causing it to go OFF. The resistor value is selected to lower the voltage across the ultra-bright LED to about 2.25 volts. At this voltage, green, blue or white ultra-brights do not emit light. Red, amber and yellow ultra-brights require a lower turn-off voltage and a slightly different circuit with an added component. The circuits are shown below. The resistor values shown are for 310 mA LED current. Values for 350 and 700 mA are shown in the charts. Values for other LED currents are easily calculated. The shunt circuit is designed be used in a series-connected, current-regulated multiple ultra-bright LED string. The circuit flashes only the LED it's paralleled with. For multiple flashing LEDs, duplicate the circuit and connect it across each LED you want to flash; as many as you want. The flasher circuits are asynchronous; each flasher operates independently (see below for synchronous flash). The shunt resistor will run warm. 1-watt, metal film flameproof type recommended. Cover the red LED flasher* if you don't want it to be seen (duh). 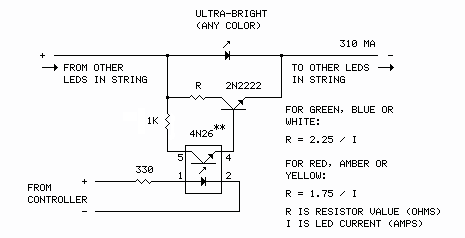 This circuit alternates between lighting a white, blue or green ultra-bright and a red, amber or yellow ultra-bright. The rate is the same, about 2 Hz. 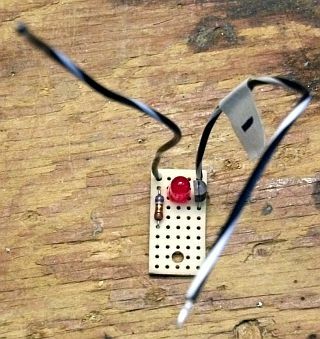 This circuit would be useful for more elaborate displays driven by a microcontroller. 5 volts DC on the control line extinguishes the ultra-bright. Up to six blue/white/green or seven red/amber/yellow or any combination of mixed colors can be flashed together. Add the turn-off voltages of the individual LEDs to arrive at the total turn-off voltage (E). Blue, white and green ultra-brights turn-off at 2.25 volts; red, amber and yellow ultra-brights turn-off at 1.75 volts. Colors can be mixed. Do not exceed 13.5 volts total turn-off voltage. Doing so may exceed the safe operating voltage limit of the red LED flasher. * For example, 3 blues and 4 reds [E = 13.75] would exceed the limit, while 6 blues [E = 13.5] would not. Note: 2-watt shunt resistor (R) recommended for multiple flasher. Note: Futurlec is pretty slow (but they're cheap). Allow 2-3 weeks for delivery. Total cost per circuit: about 54 cents US ($0.54) from suggested vendors, not including shipping. One of the ten shunt flasher circuits built for the LED-Illuminated Star. The negative lead (-) is connected to the cathode of the ultra-bright to be flashed, the other lead to the anode. Because they would be installed outside, the circuits were waterproofed with RTV. Don't let the size of this little image fool you. 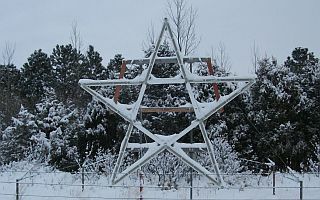 The star is 18 feet (5.5m) tall.